On June 12, 1766, the state of Virginia ratified a Declaration of Rights recognizing the inherent rights of men — a document that would become a precursor to the United States Declaration of Independence, and later, the Bill of Rights. Virginia was first settled by white men as a result of an act of the Virginia Company in 1606. The Virginia Company, stationed in England, desired a permanent settlement in the New World that would produce such commodities as the wilderness could provide. So they sent out three ships with over a hundred settlers in them, which arrived at the James River of Virginia in 1607. Regardless, the plantation continued on, and during the process continued having governmental problems due to the incompetent and greedy leaders. After becoming a royal colony in 1624, trouble with bad leaders resulted in the removal of the appointed governors and the introduction of self-government, which proved to be the harbingers of things to come. By this time Virginia, of course, consisted of much more than just Jamestown — the area was full of plantations. When the Revolutionary War hit, Virginia played a relatively small role in the actual fighting until the end. However, Patrick Henry and Thomas Jefferson were from Virginia, and the leader of the Continental Army, George Washington, was from Virginia. The last battle of the Revolutionary War, the battle of Yorktown, was fought in Virginia. This decisive battle resulted in the defeat of the British. 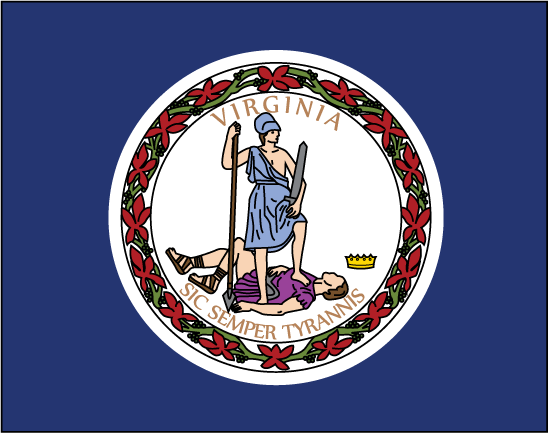 On June 25, 1788, the state of Virginia ratified the U.S. Constitution and became the 10th state to be added to the Union. The Civil War marked a change for Virginia. The pro-Union section broke off and became the state of West Virginia. Virginia, now smaller, became the seat of government for the new Confederacy, headquartered at the town of Richmond. As we know, the Confederacy lost, and Virginia became part of the Union again. The state was impoverished by the war, but fortunately they managed to recover with a big boost to their economy occurring during World War I due to shipbuilding. They continued to prosper after the war, right until the Depression. World War II helped Virginia in much the same way as the first World War did. Today, many of the federal government buildings and headquarters are located in Arlington, Virginia. Virginia is bordered by West Virginia, Maryland, North Carolina, Kentucky, and the Atlantic Ocean. It is the 35th largest state in area and is the home of the James River, the Rappahannock River, the Potomac River, and the Shenandoah River. The Appalachian Ridge runs through Virginia, as well as the Blue Ridge. There are also valleys, but the largest area is covered by rolling plains gradually sloping upwards as they draw away from the Atlantic Ocean. Virginia has several different climates within the state. A few locations, for example, have warm temperatures with long growing seasons, while on the northern side of the Blue Ridge the temperatures in winter are dreadfully cold. Rainfall is also different from one place to the next. The Shenandoah Valley receives an average of 33 inches of rain per year, while the mountainous parts of southwestern Virginia have 60 inches of rain per year. To top that off, the climate can shift in various places from year to year, as the boundaries to the recognized zones are unstable, which tends to make agriculture slightly unpredictable. Virginia is home to the world’s largest Internet services, and also has many government services. Tobacco is not the leading agricultural product anymore, nor even the second. Formerly, tobacco was how Virginia gained its riches before the Revolution and right up to the Civil War. Indeed, if it weren’t for the massive tobacco plantations, Virginia’s history would probably be very different. These days, nursery plants head the list of leading agricultural products, followed by soybeans. Tobacco is the third most extensive agricultural item. The state’s most valuable product, surprisingly, is broiler chickens. Virginia also is a coal-mining state, though not as much as West Virginia. Virginia is home of the first English settlement in America — Jamestown in 1607. Patrick Henry gave his “Give me liberty or give me death” speech in Richmond. Virginians wrote the Declaration of Independence, the Constitution, and the Bill of Rights. More United States Presidents have been born in Virginia than any other state. Norfolk Naval Base in Virginia is the world’s largest naval installation. Sixty percent of the Civil War battles were fought in Virginia. Create a state brochure using this interactive printing press. Free download from Owl & Mouse Software. Make and label your own map of Virginia. Cook up something the Virginia way! Chapters from This Country of Ours by H.E. Marshall covering the founding of Virginia begin with Sir Walter Raleigh in Chapter XII and continue through “Stories of Virginia” Chapter XXI. Classic Newbery Honor book from beloved author about Pony Penning Day on the Chincoteague Island, Virginia, and the wild ponies brought into captivity. Also from A Beka, but written for a higher level than the above title, this activity book guides state research “in a study of national, state, and local government with a brief overview of the Constitution and a variety of interesting activity sheets. In addition to government, students also study the history, geography, and other characteristics of their state and local areas.” We have enjoyed many of the activities in this book, which include writing letters to state officials, researching the state history and other activities. President George Washington was a Virginia resident. This study covers his roles as general and president. Cyrus McCormick was born in Virginia. A recommended state study unit that covers civics, history, geography, language arts, applied math, science, and art, culminating in a personalized state notebook. We have also included additional go-along resources. A wealth of original ideas and projects for making any state study a work of art! Suggestions for a unit on any state from LearningTreasures.com. Simple pages for copywork, narrations, recording state facts, or wrapping up. Not a free resource, but this set from Notebooking Nook can save you time pulling together your own pages. Includes several different pages for recording state facts, geography, economy, history, and more. The sample is helpful for seeing what types of pages are included. If you plan to notebook through all 50 states, you might be interested in the complete 50 state notebooking bundle. Color Virginia and write in the capital on this printable at PrintableMaps.net.